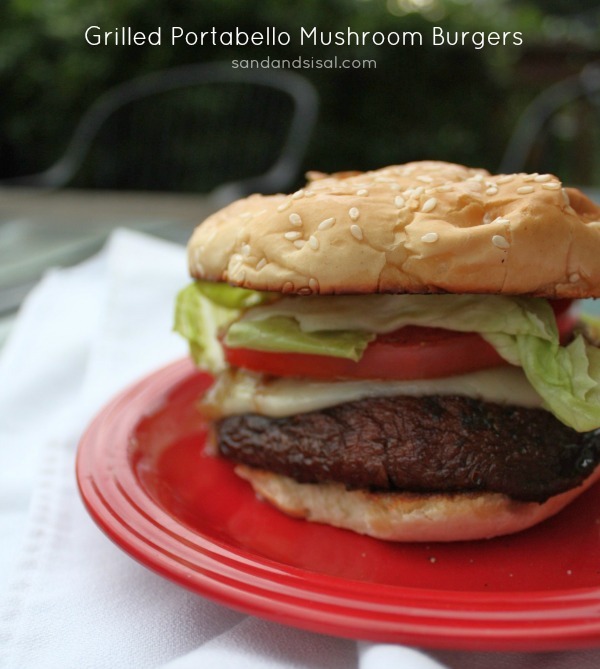 This holiday weekend I’ll be firing up the grill and making burgers for half our family and for the other half, I’ll be making Grilled Portobello Mushroom Burgers with provolone cheese. They are a delicious alternative to a meat burger. Get ready to sink your teeth into this flavorful burger. You won’t even know that you aren’t eating meat! 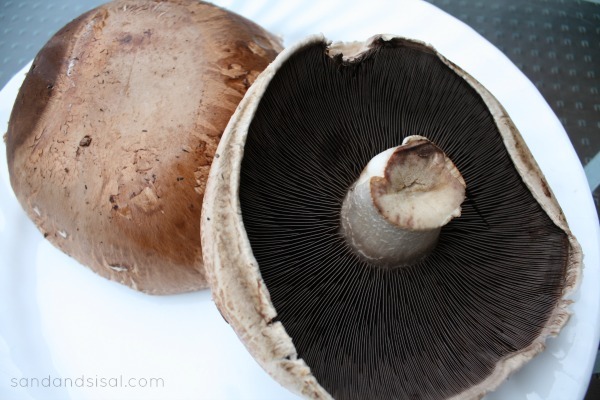 Start by cleaning 4 large portobello mushrooms with a soft cloth. Mushrooms are very absorbent and you should never rinse them under water or they will become soggy. I like to remove the mushroom gills. This is an optional step, but I find the gills seem to have a very earthly flavor. Remove the gills by gently scraping with a spoon. Follow the rest of the instructions on the recipe below. Clean the mushrooms by gently wiping with a soft cloth. 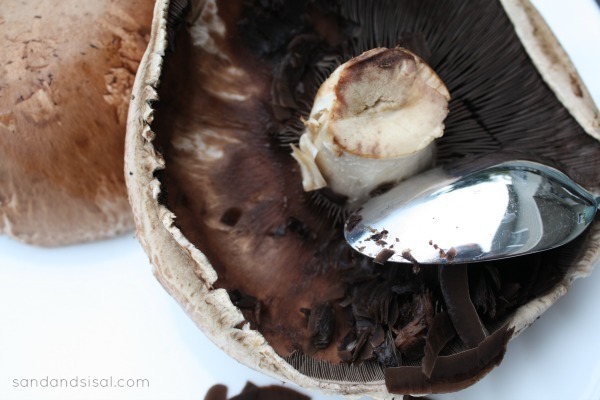 Remove the mushroom gills by scraping with a spoon. Cap side down, drizzle mushrooms with olive oil, rub to coat evenly and sprinkle with salt and pepper. Turn mushrooms over and drizzle again with olive oil. Season with salt and pepper and a light sprinkle of garlic powder. Drizzle 1 teaspoon of balsamic vinegar over each mushroom. Place on grill (cap side up) over medium hot heat for 5 minutes. Flip over and grill an additional 5 minutes. Top with provolone cheese during the last minute of grilling. 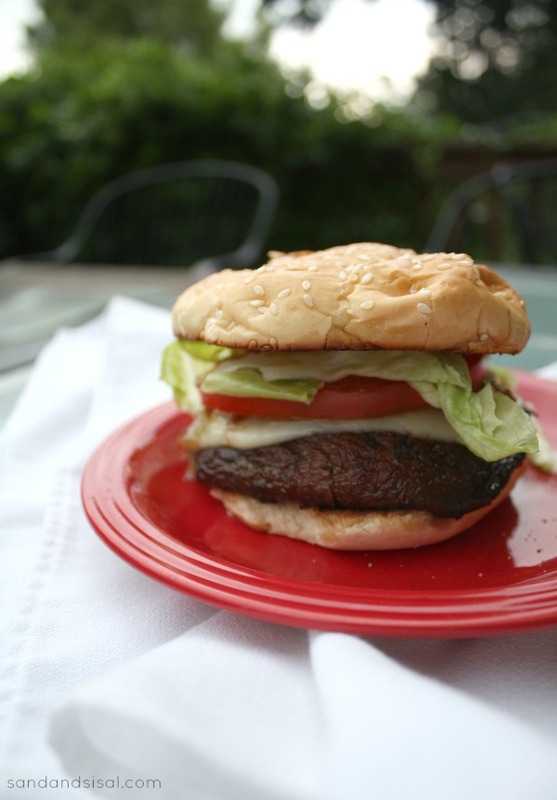 Serve on buttered and grilled buns with lettuce and tomato and enjoy! Enjoy! 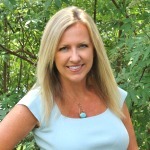 For more recipes check out Kim’s Kitchen tab up top. Hi KC! I’d love to have your portabello mushroom Parmesan recipe! Share it please!! portabello burgers are so good! Love these!